Acute decompensated HF (ADHF) is defined as the acute or gradual onset of clinical progression of HF necessitating urgent medical care. In-hospital published mortality rates of ADHF in the US and Europe range from 4% to 7%. ,,, Even with best medical therapy based on the current guidelines, 6-month adverse event rates approximate 35%. , Similar data are not available for HF from India. Data from the control arm of published Indian studies in HF intervention trials  suggest a mortality rate of around 10% over 6-month. Similarly the analysis of the data from some of the HF intervention trials from India, suggest that Indian patients are getting adequate doses of vasodilators for HF but probably tolerate lower doses of beta-blockers. Rheumatic heart disease (RHD) is also a major contributing cause of morbidity and mortality for acute HF , unlike Western populations. Since prospective data are limited regarding outcomes after hospitalization for acute HF syndromes in India. ,,, We sought to identify the characteristics and short-term outcomes of Indian patients with ADHF admitted in an Indian tertiary care center. We prospectively enrolled consecutive patients with ADHF due to systolic dysfunction admitted to our cardiology unit in the hospital-based Acute FAilure Registry (AFAR study) during a 6-month study period. Inclusion criteria included left ventricular (LV) ejection fraction <40% and worsening HF as the primary or secondary cause of admission. Patients were enrolled if they were hospitalized for episodes of new or worsening HF or if significant HF symptoms developed during hospitalization for another diagnosis. Consecutive patients were enrolled. Patients who were <18 years old and who refused consent were excluded. Patients were followed-up for 6 months for major adverse events, including death and re-hospitalization. The protocol was approved by the Institutional Ethics Committee. Data were directly collected from medical records for all clinical variables related to HF and treatment, including clinical variables such as functional class, metabolic parameters, treatment details and course in hospital. Follow-up data were collected during scheduled outpatient department visits in the HF clinic. We contacted patients who did not come for follow-up in the HF clinic via telephone to ascertain medication use, re-hospitalization, and death status. Data are reported as means (±standard deviation) for continuous variables and proportions (percentages) of patients for categorical variables. Tests of differences in treatment and patient characteristics between the two cohorts were performed using Student's t-tests for continuous variables and the χ2 or Fisher's exact tests for categorical variables. The logistic model for in-hospital death included the following variables: Age, blood pressure (BP), heart rate, baseline serum creatinine, use of intravenous inotropes, ejection fraction, baseline sodium, and gender. The study group was comprised of 90 patients [Table 1]. The mean age was 53.5 ± 17.7 years, and the majority of patients were men (63.0%) with LV systolic dysfunction. The leading causes of HF in this cohort were ischemic cardiomyopathy (53.9%), idiopathic cardiomyopathy (18.5%), and RHD (10.8%). Systolic BP at admission was <120 mmHg in 64.6% of patients. Admission heart rate was >100 bpm in 34.4% of patients. Normal sinus rhythm was present in 77% of presenting electrocardiograms, and a conduction abnormality was present in 34% of patients. Laboratory studies included: Mean serum sodium =134.8+ 6.3 mEq/L, mean serum creatinine = 1.47+ 0.8 mg/dl, and mean hemoglobin = 11.9+ 1.8 g/dl. Of the 90 patients, hyponatremia was present in 9 (10%), raised serum creatinine in 11 (12%) and low hemoglobin in 5 patients (5%). Intravenous diuretics (85.9%) and inotropes (75%) were the most commonly used in-hospital medications. In the majority, dobutamine was used (90%), and in 10% dopamine was used when initial pressures were low. At the time of this study, levosimendan had not been introduced, and milrinone was used only in 1 patient. Angiotensin converting enzyme inhibitors (ACE-I) or angiotensin receptor blockers (ARBs) were given at discharge to 71.1% and beta-blockers to 47.6%. At 1-month and 6-month follow-up, 88.2% and 96% of the 56 patients discharged were on beta-blockers, and 80.6% and 87% of patients were on either ACE-I or ARB therapy. Majority of patients were on Ramipril or other ACE-I inhibitors (82%), and 18% were on ARBs. The beta-blockers used were usually low dose: Carvedilol ranging from 3.125-6.25 mg daily at discharge (mean = 4 ± 1.4 mg) (94%). Ramipril doses at discharge were also low (3.1± 1.6 mg). Metaprolol, nebivolol or ivabradine were rarely used. In-hospital mortality was 30.8%. Majority of in-hospital deaths were due to progressive HF (92%), and the rest were due to intractable arrhythmias (6%) or renal failure. Cumulative 1-month, 3-month, and 6-month mortality rates of discharged patients were 15.8%, 26.3%, and 26.3%, respectively. There were 42 patients surviving at the end of 6-month of follow-up. This suggested that the maximum events were occurring either within the hospital or within 3-month following discharge. Combined postdischarge major adverse event rates (death or re-hospitalization) were 27.3%, and 38.1% at 1-month and 6-months, respectively. 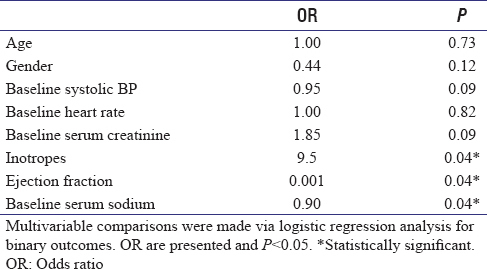 Baseline serum sodium (P = 0.04), exposure to inotropes (P = 0.04), and lower ejection fraction (P = 0.03) were associated with an increased risk of in-hospital mortality [Table 2]. There were no other statistically significant predictors of inpatient mortality. This study provides descriptive data for acute HF patients in a tertiary medical center. This study provides initial insights into the presentation, treatment, morbidity and mortality of ADHF in India. 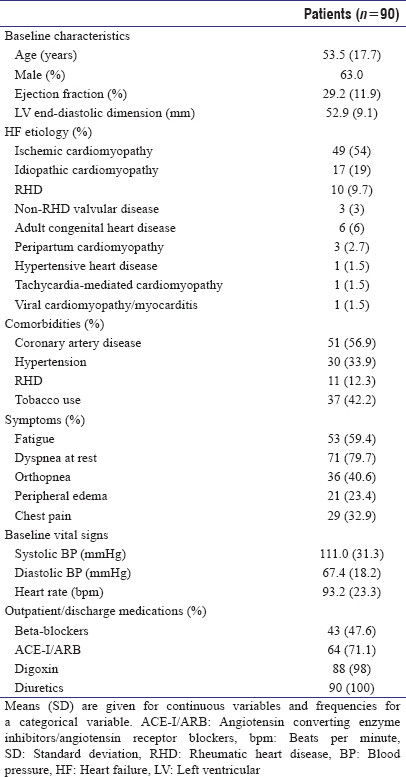 The patients were relatively young (mean age 53 years), the causes were usually ischemic cardiomyopathy or idiopathic cardiomyopathy thought RHD was also a contributor. Mortality was high though patients were receiving medications as per the HF guidelines though at lower doses. Our patients have high rates of in-hospital mortality (30.8%), 6-month mortality (26.3%) and 6-month re-hospitalization (39.5%), which likely reflect the severity of illness of these patients. 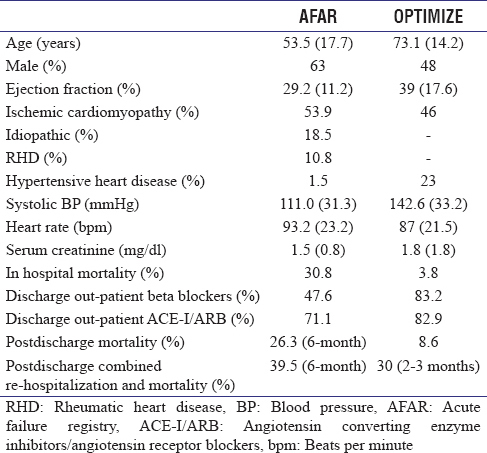 Data from ADHERE, OPTIMIZE-HF, EURO-HF demonstrate an overall in-hospital mortality rate of 4-7%, 90-day (limit of follow-up) mortality rate of 5-15% (depending upon presenting systolic BP), and 3-month re-hospitalization rate of 24-31% [Table 3]. ,, Our data show a very high mortality both in-hospital and also after discharge. This reflects the very sick nature of the patients who ultimately get admitted at this tertiary hospital due to triage. The less sick patients get referred to other hospitals or are managed in the emergency services for 24-48 h and then discharged after partial stabilization. The mean systolic BP of patients in the patients was relatively low at 111.0 mmHg, which is likely a marker of end-stage disease present in the majority of these patients. For OPTIMIZE-HF patients with the lowest quartile of admission systolic BP (<120 mmHg), in-hospital mortality was 7.2%. For ADHF patients with an admission systolic BP <120 mmHg (63% of ADHF patients), in-hospital mortality was 40.5%. Admission systolic BP was <90 mmHg in 2% of ADHERE patients, 8% of OPTIMIZE-HF patients, and 19% of ADHF patients. , The worse prognosis conferred in those patients with lower BP s is likely due to progressive pump failure. Our series also had only patients with systolic HF while majority of these registries included patients with preserved systolic function also which would have lead to higher baseline systolic BP and higher overall ejection fraction. Despite similar diagnostic rates and adherence to performance measures as compared to Western literature, 6-months mortality and 6-months re-hospitalization rates in the patients were 26.3% and 39.5%, respectively, which may reflect the severity of illness presentation in this cohort. The scope of this project carries inherent limitations. These cohorts have been limited to a single urban tertiary medical center in India, which represents only a fraction of India's heterogeneous population and may limit its validity. Data from other centers throughout India and other measures of ADHF care, such as quality-of-life and cost-effectiveness are also needed. This registry describing baseline and outcome data regarding patients at a tertiary medical care center with acute or recent decompensated HF is the one of the first published data of its kind. Our data indicate a higher in-hospital and short-term mortality in patients with ADHF in India. This is data from a tertiary hospital and could reflect very sick patients. A larger representative nationwide registry could provide more accurate information to appropriately direct resources for improved cardiovascular health. An international randomized trial comparing four thrombolytic strategies for acute myocardial infarction. The GUSTO investigators. N Engl J Med 1993;329:673-82. A comparison of reteplase with alteplase for acute myocardial infarction. The Global Use of Strategies to Open Occluded Coronary Arteries (GUSTO III) Investigators. N Engl J Med 1997;337:1118-23. Assessment of the Safety and Efficacy of a New Thrombolytic (ASSENT-2) Investigators, Van De Werf F, Adgey J, Ardissino D, Armstrong PW, Aylward P, et al. Single-bolus tenecteplase compared with front-loaded alteplase in acute myocardial infarction: The ASSENT-2 double-blind randomised trial. Lancet 1999;354:716-22. Gheorghiade M, Zannad F, Sopko G, Klein L, Piña IL, Konstam MA, et al. Acute heart failure syndromes: Current state and framework for future research. Circulation 2005;112:3958-68. Fonarow GC, Abraham WT, Albert NM, Gattis Stough W, Gheorghiade M, Greenberg BH, et al. Influence of a performance-improvement initiative on quality of care for patients hospitalized with heart failure: Results of the Organized Program to Initiate Lifesaving Treatment in Hospitalized Patients With Heart Failure (OPTIMIZE-HF). Arch Intern Med 2007;167:1493-502. Fonarow GC, Heywood JT, Heidenreich PA, Lopatin M, Yancy CW, ADHERE Scientific Advisory Committee and Investigators. Temporal trends in clinical characteristics, treatments, and outcomes for heart failure hospitalizations, 2002 to 2004: Findings from Acute Decompensated Heart Failure National Registry (ADHERE). Am Heart J 2007;153:1021-8. Fonarow GC, Abraham WT, Albert NM, Stough WG, Gheorghiade M, Greenberg BH, et al. Association between performance measures and clinical outcomes for patients hospitalized with heart failure. JAMA 2007;297:61-70. Cleland JG, Swedberg K, Follath F, Komajda M, Cohen-Solal A, Aguilar JC, et al. The EuroHeart Failure survey program - A survey on the quality of care among patients with heart failure in Europe. Part 1: Patient characteristics and diagnosis. Eur Heart J 2003;24:442-63. Cuffe MS, Califf RM, Adams KF Jr, Benza R, Bourge R, Colucci WS, et al. Short-term intravenous milrinone for acute exacerbation of chronic heart failure: A randomized controlled trial. JAMA 2002;287:1541-7. Seth S, Narang R, Bhargava B, Ray R, Mohanty S, Gulati G, et al. Percutaneous intracoronary cellular cardiomyoplasty for nonischemic cardiomyopathy: Clinical and histopathological results: The first-in-man ABCD (Autologous Bone Marrow Cells in Dilated Cardiomyopathy) trial. J Am Coll Cardiol 2006;48:2350-1. Ramachandran K, Husain N, Maikhuri R, Seth S, Vij A, Kumar M, et al. Impact of a comprehensive telephone-based disease management programme on quality-of-life in patients with heart failure. Natl Med J India 2007;20:67-73. Joshi PP, Mohanan CJ, Sengupta SP, Salkar RG. Factors precipitating congestive heart failure - role of patient non-compliance. J Assoc Physicians India 1999;47:294-5. Callender T, Woodward M, Roth G, Farzadfar F, Lemarie JC, Gicquel S, et al. Heart failure care in low- and middle-income countries: A systematic review and meta-analysis. PLoS Med 2014;11:e1001699. Murray JL, Lopez AD. The global burden of disease: A comprehensive assessment of mortality and disability from diseases, injuries, and risk factors in 1990 and projected to 2020. Boston, MA: The Harvard School of Public Health; 1996. Murray CJ, Lopez AD. Global Comparative Assessments in the Health Sector. Geneva, Switzerland: World Health Organization; 1994. Yusuf S, Ounpuu S. Tackling the growing epidemic of cardiovascular disease in South Asia. J Am Coll Cardiol 2001;38:688-9. Adams KF Jr, Fonarow GC, Emerman CL, LeJemtel TH, Costanzo MR, Abraham WT, et al. Characteristics and outcomes of patients hospitalized for heart failure in the United States: Rationale, design, and preliminary observations from the first 100,000 cases in the Acute Decompensated Heart Failure National Registry (ADHERE). Am Heart J 2005;149:209-16. Gheorghiade M, Abraham WT, Albert NM, Greenberg BH, O'Connor CM, She L, et al. Systolic blood pressure at admission, clinical characteristics, and outcomes in patients hospitalized with acute heart failure. JAMA 2006;296:2217-26. Konstam MA, Gheorghiade M, Burnett JC Jr, Grinfeld L, Maggioni AP, Swedberg K, et al. Effects of oral tolvaptan in patients hospitalized for worsening heart failure: The EVEREST Outcome Trial. JAMA 2007;297:1319-31.